Woot Woot! It’s Thrift Score Thursday! Each week, Trisha from Black and White Obsession, Cassie from Primitive and Proper,Corinna from For My Love Of, Brynne from The Gathered Home and a weekly guest co-host will pick a favorite thrift score or two to feature! 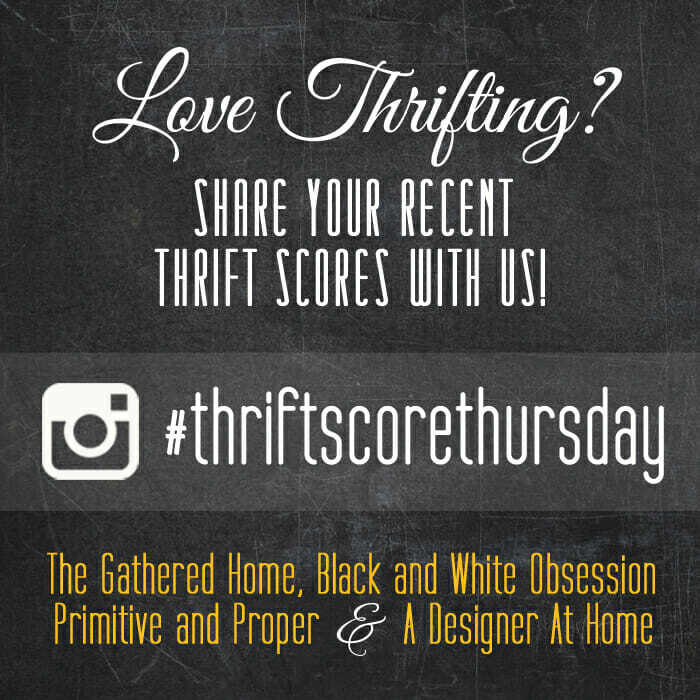 So please note that by linking up with#thriftscorethursday, you are giving us permission to share your finds via social media or on our blogs. This week we welcome back Dena from Hearts & Sharts as our lovely thrifty guest host! My find this week came from one of my Sweet Clover vendors. We welcomed the ladies of The Mill at Keymar as new vendors recently. I had been wanting to check out their own shop, so this past weekend I stepped away from sales books data entry for a bit to pay it a visit. Their shop was lovely and I found a few things, but my absolute favorite was a little gold scale that works. It was $20 which I felt was a great price for a non-thrift shop! 🙂 So although it wasn’t a thrift shop, it’s vintage and a great price, so it’s my find this week. 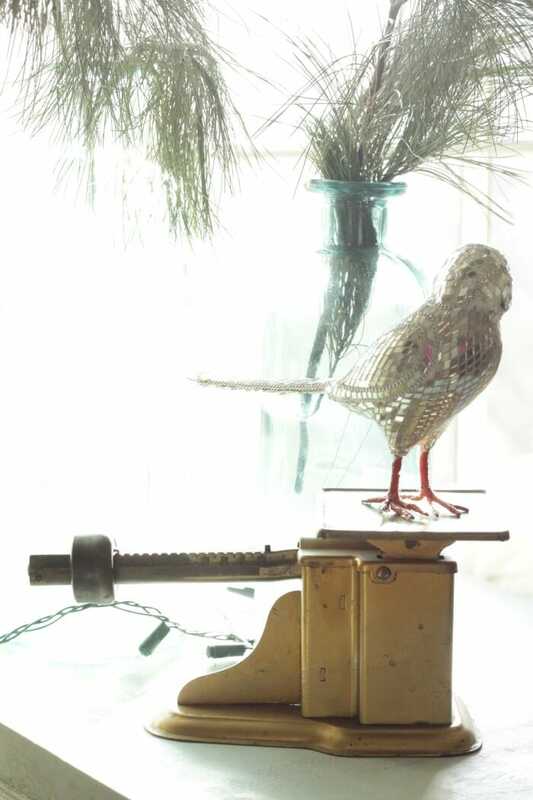 I placed it on my dining room sideboard as a perch for my shiny disco bird, which was a previous TST find. I love the print on the side of the scale. Now for my features… I always love sifting through your finds to choose my favorites. It’s the thrill of the hunt without leaving my house. And without actually getting anything, I suppose. So there is that. 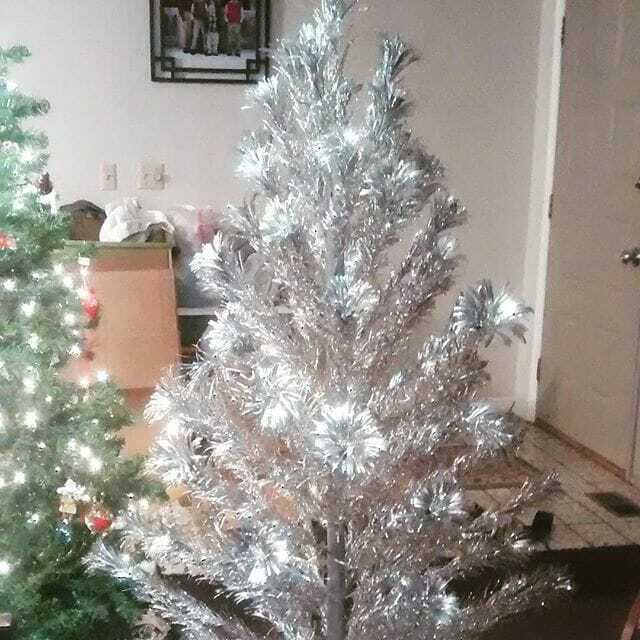 I love a good tinsel tree, and Brittany scored this amazing vintage aluminum tree… It’s a thing of beauty! You can find Brittany on instagram here. I am a huge fan of Karrie Anne’s eclectic style. 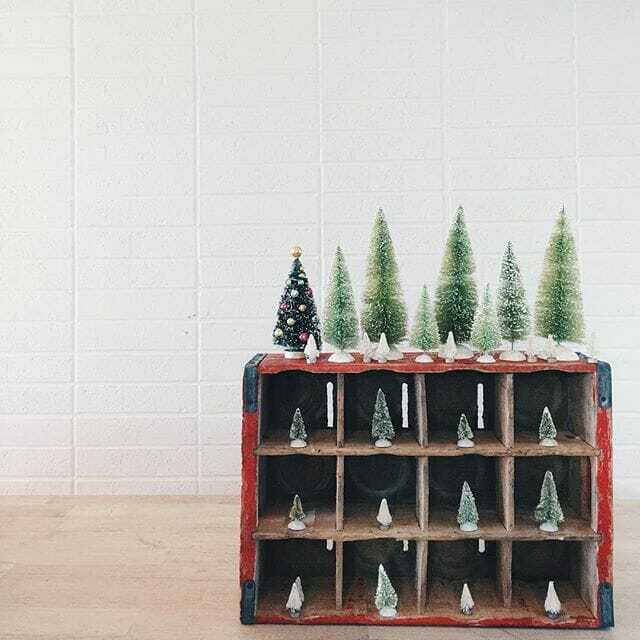 I love how she styled this vintage coke crate she once thrifted. You can find Karianne on instagram here. 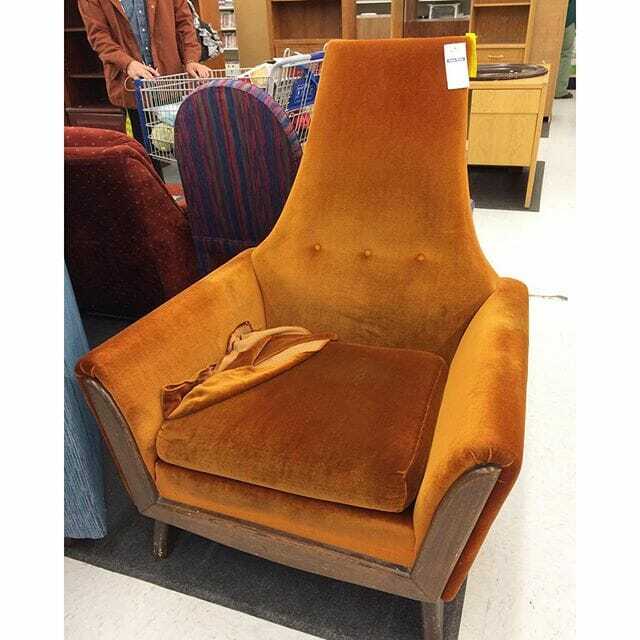 Lindsey, who owns an awesome etsy print shop, found this phenomenal chair which she is going to recover. You can find Lindsey on instagram here. 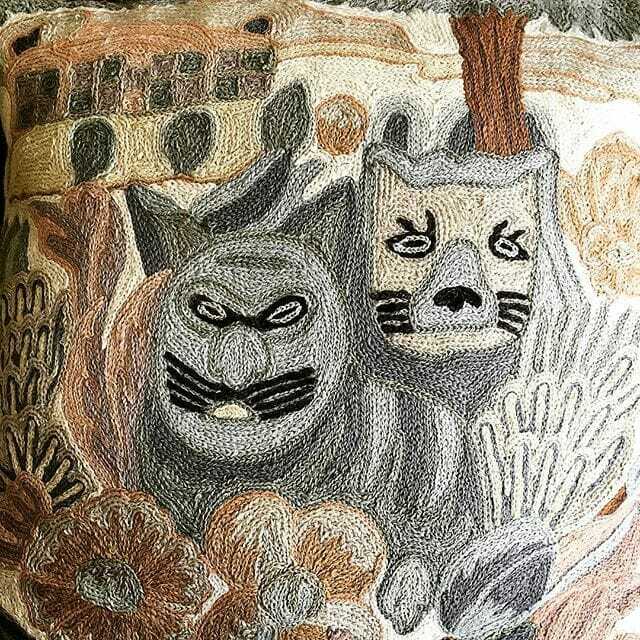 I love some good crewel work, but this piece Maria scored takes the cake. It might go down in history as my favorite crewel work ever. EVER, people. You can find Maria on instagram here. 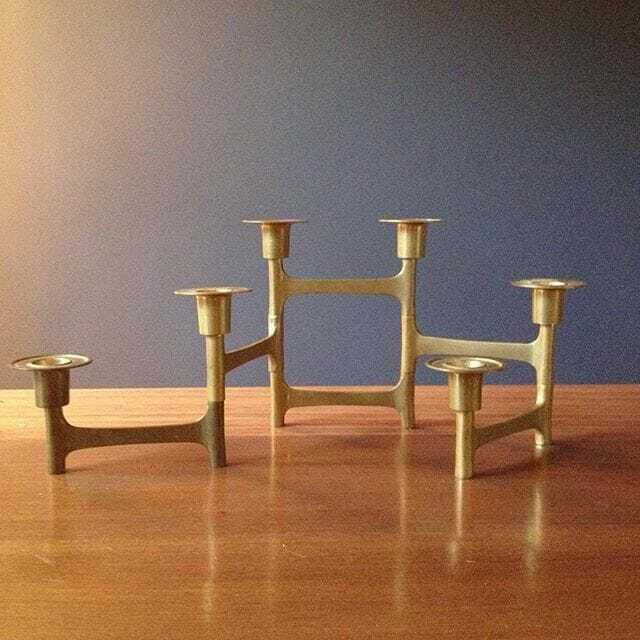 And finally, I am digging this midcentury candelabra from the girls at Red House West. Check out their blog because I officially and a fan of their style. You can find Mera & Katie on instagram here. Now be sure to visit all of my cohosts to see their finds and features! We will see you next week- until then happy hunting and holiday shopping!!! i know, right? what a great shape! Cassie, I looooove that gold scale! I would have bought it in a heartbeat too! Perfection! Also I came *this close* to featuring that crewel work from mariaski63 too!!! It’s so amazing! i would have died if you had picked it, too! Fabulous taste in thrift scores, muh-dahling! Thank you for this week’s co-host posish! That candelabra is on point! And your scale is such a great find. thank you, arielle! yes, i want a candelabra like that now! How cute is that Coke crate? Great idea just now for Advent next year!!! Also, the crewel work…best she stumbled on that alone….that would have been a leg wrestling match for sho! yes! i would have wrestled for that for sure! Thank you! 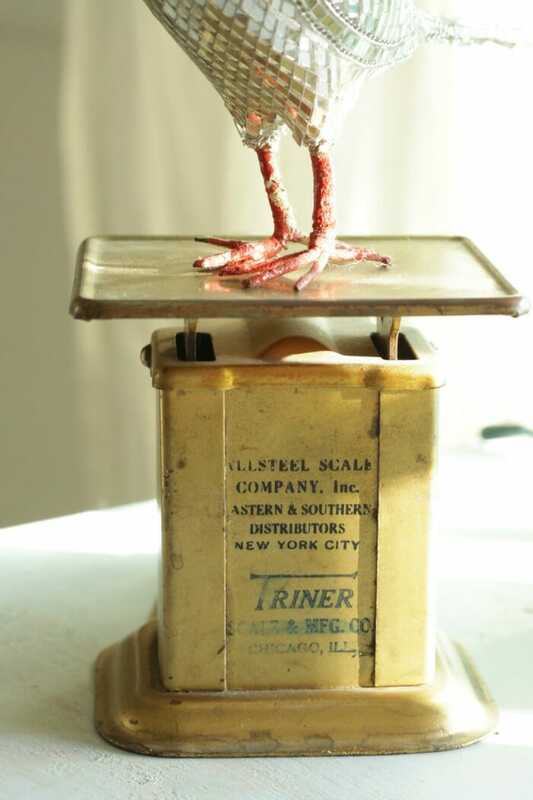 And that scale is the perfect perch for the disco bird – love it! Oh my goodness that chair!!! It is spectacular! i know! i want it!